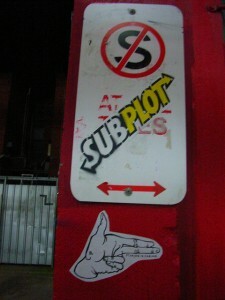 Subplots are a connected sequence of events, just like any other plot; the difference is that this is a minor plot with fewer developments. It should affect the main plot in some important way–or else you should delete it–but it doesn’t need the same development of a main plot. I am still plotting my trilogy, and I’m taking a different strategy this time. I am working on the plot line for the entire trilogy before I start writing. Each book focuses on a different aspect of the overall story problem, so in some respects, each book is a subplot. Yet, overall, the story needs a throughline, or a question that overshadows everything. In my sff trilogy, the overriding question is will the Risonian planet blow up, killing all Risonians? Or, will they find a new home and refuge? The subplots will focus on different characters in the story and how they answer different parts of the overall problem. There are three romance subplots, various political subplots, and a couple survival subplots. Characters are motivated by revenge, by a quest of power, or by a sense of desperation. That’s all good! In a long story–such as a series or even just a trilogy–the story needs to have some depth and breadth, and subplots have the potential to help. As I say in START YOUR NOVEL, it helps to look over 29 different plot templates and decide on the overall plot for your story. Clearly, my story is about survival, and I can echo that with other smaller stories or subplots of survival. I can also contrast with someone who is out for revenge and cares nothing for survival; revenge at all costs makes for desperate–and potentially compelling–drama. Romance plots: OK, these should be a given in most stories, even if it’s just a love story between a boy and his dog. It often happens that I am trying to work out the main plot but get stumped. What happens next? I’ve no idea. Then, it’s time to turn to the subplot that has been patiently awaiting notice. What happens next in the subplot? Part of getting stuck is the fear that if I make a major decision about the trajectory of the story, I’m stuck with it. If it’s wrong, it will mean a major revision. Subplots, though, are small and contain fewer scenes. Make a mistake there and it’s much easier to revise later. By focusing on a smaller problem, you put less at risk. Sometimes I have to go down the list and answer the “What next?” question for each subplot before I get inspiration for a better setting, more compelling emotions, or a larger conflict. Often, figuring out the next logical step for a minor plot shakes loose a detail that will make everything connect better. Oh! So, she’s the main character’ sister, and that’s why she wants revenge. The new revelation sends me back to the main plot with a new twist on the action. When I’m really stuck, I repeat this process with every subplot from action to romance. For example, a romance subplot implies that tension and conflict permeates the man-woman relationship. How does the betrayal, the attraction, the hate, the love, and the self-sacrifice relate to and affect the main plot? Progress is slow on this huge plot. Thanks to subplots, though, it is progressing! What happens next? My story gets plotted! Is your thoughline equivalent to theme? A clear overall theme often hides from me. Do you have a great way to find an overall theme (throughline)? I try to find a good theme to guide me from the start, and I deplore my writing time that was wasted on my banal themes. I want my theme as acceptable as a naked lover. I’m certain readers feel the same with their time. Have you read three chapters deep and discovered themes so trite— you gave the book to an enemy? No, I’m not saying that a theme equals a throughline. A throughline is the storyline that you follow all the way through the story. It’s the main plot line. It can get lost in the shuffle of all the subplots and everything else, if you’re not careful. This is more a plea for making sure that the main plot stays the main plot. Themes are often unspoken. It’s the question of what the story is about, not what it’s doing. What a story is doing is the plot; what it means is the theme. Yes, often, it’s hard to tease out a theme from what you are writing or reading, but it’s there somewhere. What’s your advice to a writer that struggles to follow the main plot and get distracted with the little things that really doesn’t improve the characters but it just feel right to squeeze it there. You already know the answer! Cut anything that distracts from your story!